Using heroin is like playing Russian roulette with your life. Can dosing be controlled? We explore here. Heroin is strong enough to cause sudden and immediate death. This means that not only can using heroin cause addiction, it is also capable of provoking a myriad of life threatening and fatal consequences. What amount of heroin can cause an overdose? How dangerous can a heroin OD be? And can you control dosing enough to be able to take heroin safely? We explore the answers to these questions here. Then, we invite your personal questions in the comments section at the end. In fact, we try to respond to all questions personally and promptly! How much heroin is safe? No amount of heroin is safe to use. If you feel that you need heroin to function normally, this is a sign that you have a problem. And even if you consider yourself strong enough to quit whenever you want, you are still exposed to a great risk of addiction or possible overdose. Using heroin has nothing to do with a strong will and/or determination, but everything to do with heroin’s addiction potential. How much heroin can you take at once? It depends mainly on your level of tolerance and drug purity. Heroin enters the bloodstream and travels to the brain quickly. But, as you continue to use heroin, ever increasing amounts are needed to reach the sought effects. This is the effect of tolerance, and is expected in any drug that is in the opiate or opioid class of drugs. So, how much do people use on average? Recreationally, users have reported taking daily heroin doses in range from 5 mg up to1,500 mg. The average daily dose is estimated to be 300-500 mg. Addicts usually inject heroin 2-4 times per day. Heroin is often mixed with methamphetamine or cocaine and injected or co-administered with alcohol, alprazolam, MDMA (Ecstasy), cocaine, or diphenhydramine. Whether you have just taken heroin for the first time, or you are a frequent user; you face equal health risks because each individual reacts differently to this drug. Effects can vary from mild to severe and can result in long-term consequences. How much heroin to overdose? If you suspect that someone is using too much, you should be able to recognize a number of visible physical and mental symptoms, and seek immediate medical help. Overdoses can be dangerous and lead to loss of consciousness, coma, and even death. How much heroin is fatal? Can you die from taking heroin? YES! 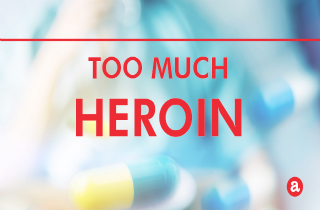 Any dose of heroin can be too much, lead to an overdose, and have a fatal outcome. Some sources say that depending on the mode of administration, the lethal dose for an average 170lbs opiate-naive individual is from 75 mg to 375 mg. NOTE: If suspect that you or someone close to you have taken an OD amount of heroin, immediately Call 911 or the National Poison Control Center (1-800-222-1222). It’s very important not to make the overdosed person throw up unless you are told so by a Poison Control or a health care professional. If you are looking for medical help for an overdose emergency, please Call 911 or take the overdosed person to the ER. In case you are not certain about what you should do, Call the Poison Control Center on 1-800-222-1222 to speak with a poison expert and get instructions on what you should do next. We welcome your questions and comments in the designated section below, and try to respond personally and promptly to all legitimate inquiries. Heroin overdoses to not cause immediate death. Overdose is a prolonged process, with ample time for intervention. There is an extended period of respiratory depression that results in death (Darke S., RossJ., Zador D., Sunjic S. Heroin-related deaths in New South Wales, Australia 1992-1996. Drug Alcohol Depend 2000; 60; 141-50.). Heroin overdose is a catch all term for any death that is heroin related and most often it is actually a polydrug toxicity death. (Kerr T., Fairbairn N., Tyndall M., Marsh D., Li K., Montaner J. et al. Predictors of non-fatal overdose among a cohort of polysubstance-using injection drug users. Drug Alcohol Depend 2007; 87; 39-45.) While Heroin is a dangerous drug, it should be presented accurately so that those who may be researching it have correct information. Thank you for your input, Conner. Hope other readers will find your information useful.